I went to the Warbirds Over Monroe air show this weekend. This is the first air show I have attended with serious photography gear. The last time was probably in the mid 1980's. The high cirrus clouds made for an interesting sky, but later on as an upper level low came through, it made shooting challenging as the light was not as intense. 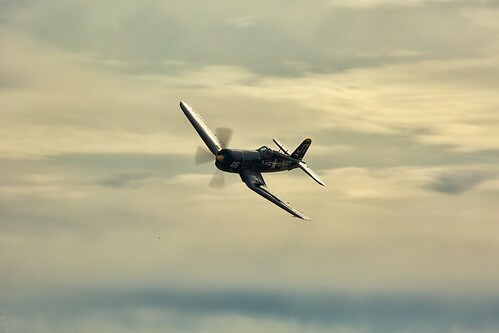 That was when I made this shoot of a Chance Vought F4U Corsair, probably my favorite shots of the whole weekend. I saw how the light was playing on the wings and I loved the contrast and angle. Copyright © 2010-2015 Mark Steven Houser, houserphotography.net and MarkStevenHouser.com All rights reserved.